Before I start writing about my journey, I want to tell you that my story is not intended to be miserable. It is more the story of learning to live and enjoy life under somewhat adverse conditions. If you want to see misery, you need only turn on the news. Since the day of my stroke, my family and I have laughed a lot more than we’ve cried. There will be some sad posts along the way. I can not be true to my story without them. This morning on Facebook, an incredibly strong woman I know, by the name of Lyn Caslick, wrote a post that so beautifully describes what I aim for everyday. Lyn lost her beautiful daughter Kelly Hammond to breast cancer less than 3 months ago. Her daughter was one of my dearest friends and one of the most courageous, loyal and giving people I have ever met. You will meet Kelly throughout my story. Life throws many struggles our way. We learn and grow so much as we deal with them. I have most certainly learnt to count all my blessings, no matter how small. 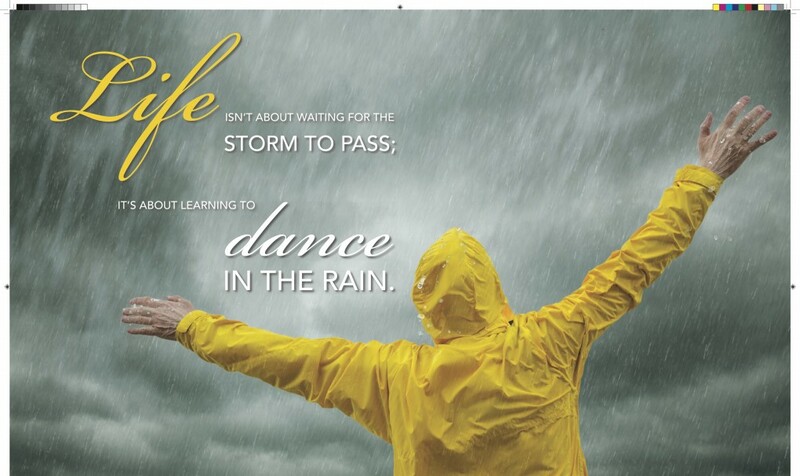 Together as a family, we have learned to dance in the rain. September 29, 2013 in My Inspiration. Lyn is a courageous wonderful woman and never wiser words have been said. I have always been told a saying from my mother that still is so important in my life and now I try to install it into my own family and use people as yourself and Lyn as examples. “Our glory lies not in never falling, but rising every time you fall”. Yourself and Lyn are both a living example of this……….